How to win money on pokies in Australia? Free pokies online > Free online pokies Australia > How to win money on pokies in Australia? Even though pokies are not a game that falls into the category of strategy games or games of skill, there are some tips that you could follow to maximise your chances to win and keep your losses to a minimum when playing online pokies for fun or real money. Don’t play for real money right away! 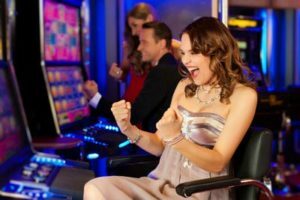 However eager you are to try out the newest Aristocrat pokies or Microgaming slots, it’s best to play for fun at first. Take time to understand the features of the game, to see whether you like the game, whether there are any bonus rounds or free spins. Each game has a demo version or a free play version that you can use to familiarise yourself with the pokie of your choice. Once you’re sure you like what the game has to offer, you can register an account, and start playing the real deal with more confidence. Some online casinos offer free welcome bonuses or deposit match bonuses that could be as high as 100% of your first deposit. Other casinos offer free spins on certain pokies plus a deposit match bonus. Casinos that offer higher bonuses usually have some wagering requirements as well, but there are casinos that offer smaller sign-up bonuses without any wagering or deposit requirements. If you’re torn between two different pokies at two different casinos, choose the one that has a more advantageous bonus system. Most online casinos have some version of a loyalty programme that allows players to gather points, which they can later use to claim bonus credits or bonus games. Progressive pokies are fun and winning the jackpot can indeed change your life, however, pokies with such high jackpots pay out less often. Unless you’re determined to win a life-altering amount of money, stick to pokies with lower jackpots as these are more likely to pay out. The fact that a pokie was hot or cold is not indicative of a future win or loss. Don’t get carried away by these buzzwords and understand that pokie machines use random number generators to generate numbers that determine the stops on which a reel winds up. No amount of strategy can predict these stops. Each spin is an independent event unrelated to the previous one. Some casinos have better return-to-player percentage than others, choose the ones with a higher RTP percentage, especially if you plan on playing regularly. Video pokies are also known to have better pay-out rates. Read our take on how to win at roulette section! Always play with a clear head and never bet money you can’t afford to lose. If you’re on a winning streak, stop while you’re ahead, because you can lose it all on your next spin(s). The ultimate winning strategy when playing the best pokies is to have fun. If you’re focusing more on the fun and less on the win, you’re less likely to get tempted to start strategizing over something that depends on just how lucky you are. How to win at pokies? Play for fun in practice play mode and then play for real money! You will have now a clue how to win money on pokies! We wish you good luck!